In this SAP IDoc tutorial I'll try to show how SAP users can save IDoc as local file in WE02 transaction. 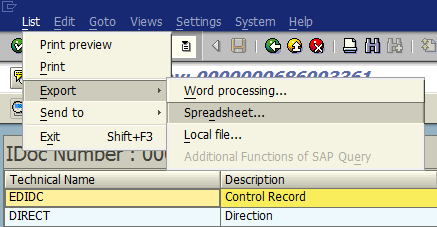 In other words, how to export IDoc document as Excel spreadsheet file and download to your computer within SAP WE02 tcode. First of all, ABAP developer or SAP user should call SAP transaction WE02 and filter an IDoc document which you want to export as Excel file to your local file system. Don't worry, this Print Idoc option will not immediately print IDOC document from your network printer. 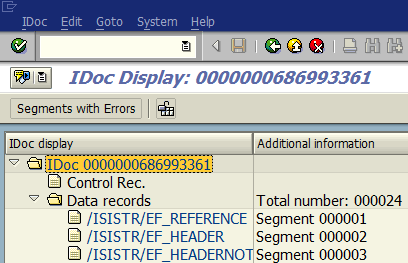 IDoc document contents will be displayed in key value pairs in the new IDoc Display screen. 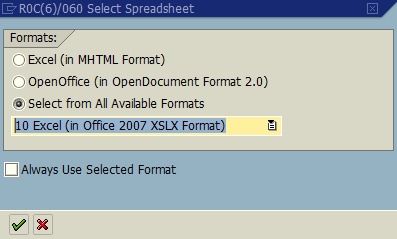 In this SAP screen, go to menu options "List > Export > Spreadsheet..."
This screen enables SAP users or ABAP developers to export IDoc document as a spreadsheet in different formats like Excel (MHTML) or OpenOffice, or in Excel 2007 (XSLX) or Excel 2003 format, etc. When you choose the file format press Enter or OK button to continue to export IDoc as local Excel file. The following screen will request you to point where you want to save the IDoc export. After you choose the folder destination for your IDoc file, you can press Save button to complete the IDoc export task and finish to download IDOC to text file in Excel format.